Alex gets very excited when he see’s cars that he really likes. 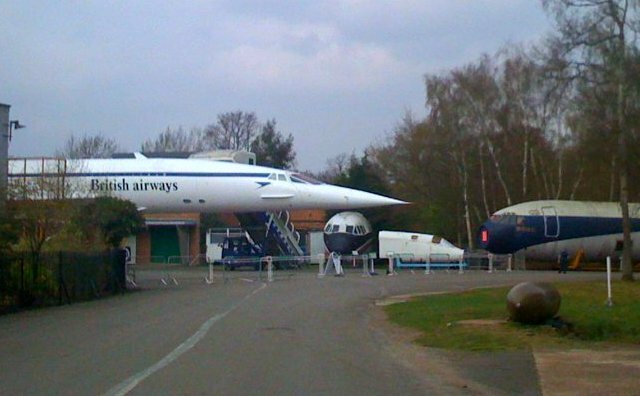 He breaks into squeals and shouts of joy, but today’s trip out to Brooklands Museum in Weybridge was a real eye opener…. The first building we entered had F1 cars in it… as Alex stepped into the room he just stopped dead… not a sound… he was overwhelmed!!! He then started naming the cars! Now I’ve mentioned before about his car knowledge, but today he surpassed himself as we walked around the vintage motors. 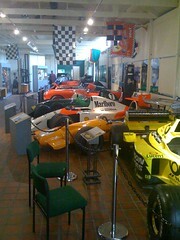 We walked into one room with some really old cars in, and straight away he was naming them… Vauxhalls, Morgans, MG’s…. and then in the corner we saw a really old car….. and over Alex went and happily told me it was a Bugatti!!! In yet another room he told me about the red 1930’s Maserati and a very early 1900 and something Peugeot… one of those that look like an old stage coach! He said it was a Peugeot granny car…. In one showroom there was a staged room belonging to a car designer. 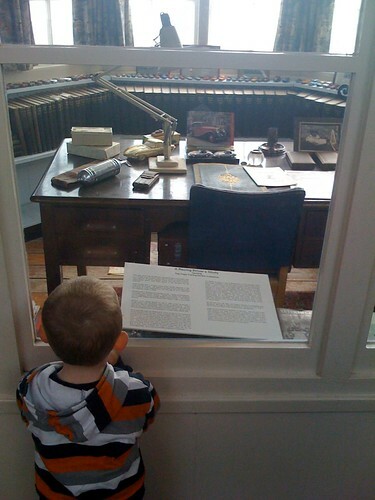 It was full of small models on the window ledge… which Alex started naming… He’s less than a month from his 3rd Birthday, so hearing him name vintage race cars just seemed so odd! He’s very good at it! A lot of the exhibits were things that my Dad had been heavily involved in – so I felt a warm nostalgia as I recollected the tales people told me of what he had achieved. He used to work alongside famous test pilots and engineers – notable names such as Bill Bedford and Barnes Wallace (Bouncing Bomb fame). Vickers Wellington bomber, Hawker Hurricane, Harriers and Kestrels… Bouncing bombs and Tall Boys… lots of history… All of which Alex really enjoyed…. 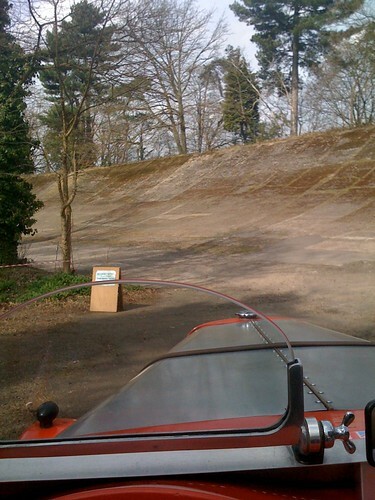 but this is Brooklands, and the home of a motor racing circuit that is 102 years old… or what is left of it…. 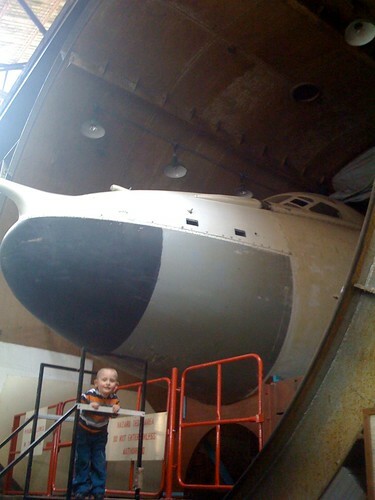 Alex under the huge nose of the Valiant V-Bomber in the Stratosphere Chamber - out of sight is the 100 ton chamber door! The circuit saw the fastest cars of the day – record breakers and racers – and a lot of them are on display. The steeply banked track is close to impossible to walk up – and very scary to try and climb down again as it is near vertical at the top! I always wondered what it would be like to go around the banked track, and today I had to wonder no more… They had a range of vintage and vintage style cars … and a Corvette … taking passengers up the (crazily steep) Hill Climb and hard right onto a woodland surrounded dirt track that swooped down and joined onto some of the remaining original circuit… tha part with the steep banking…. As we swept down the woodland road onto the race track our driver gunned the engine and took us up the steeply banked track – I say steeply banked track, but I think “wall” is a better description! 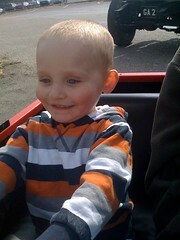 Alex loved it so much (squealing and grinning with joy) that we had to go around twice! It really was fantastic! The photo’s don’t do the angles justice! 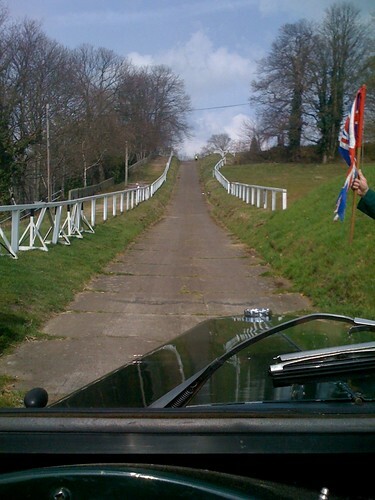 The Hill Climb - We rocketed up this! Getting ready to climb the bank.... It did not feel natural to be going so fast at such an angle of sideways tilt! 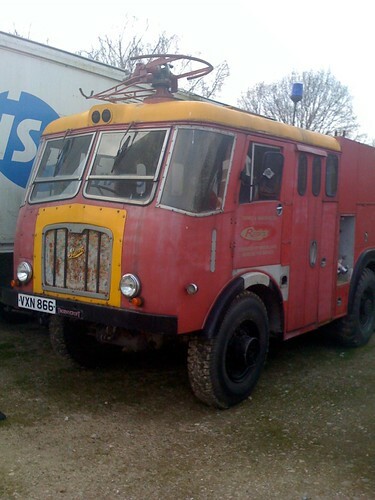 A final mention goes to this old fire engine. I’ve just had my 36th birthday… but I don’t feel so old… until I see an engine that I used to drive as part of my job!!! I used to be part of the Dan-Air (Lasham) airfield fire crew. We had old RAF and Airport fire vehicles, and this very engine was one that I used to drive! How old does it make you feel to see something you actually used sitting there in a museum! VXN... the old engine I used to drive! Vulcan 2008, originally uploaded by L.B. 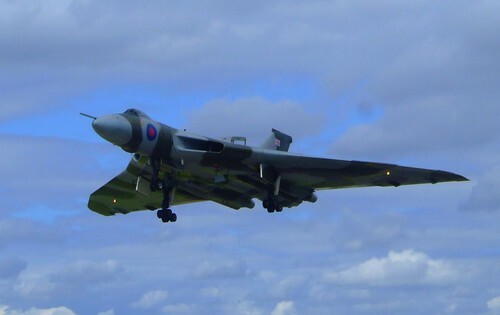 It gave me such a great feeling to see this cornerstone of British aviation take to the skies again. The awesome sound of the engines as she started her take of roll just a few hundred yards from me…..and the breath taking, ground and gut twisting thunderous rumble of the four RR-Olympus engines (like Concorde’s) as she accelerated down the runway before rotating into a steep take off climb.